Ernst Kals (2 August 1905 – 2 November 1979) was a Kapitän zur See with the Kriegsmarine during World War II. He commanded the Type IXC U-boat U-130 on five patrols, and sank twenty ships, for a total of 145,656 tons of Allied shipping. He was awarded the Knight's Cross of the Iron Cross. The Bombardment of Curaçao refers to a 1942 German naval bombardment of a Bullen Baai Company petroleum storage facility on the small South American island of Curaçao during World War II. The raid to destroy or ignite the petroleum failed and the German U-boat responsible was unsuccessfully engaged by a Dutch shore battery before escaping. The 2nd U-boat Flotilla, also known as the Saltzwedel Flotilla, was the second operational U-boat unit in Nazi Germany's Kriegsmarine. Founded on 1 September 1936 under the command of Fregattenkapitän Werner Scheer, it was named in honour of Oberleutnant zur See Reinhold Saltzwedel. Saltzwedel, a U-boat commander during World War I, died on 2 December 1917, when his submarine UB-81 was sunk by a mine in the English Channel. Emden is an independent city and seaport in Lower Saxony in the northwest of Germany, on the river Ems. It is the main city of the region of East Frisia and, in 2011, had a total population of 51,528. As commander of U-130 Ernst Kals reportedly sank 17 merchant ships for a total of 111,249 gross register tons (GRT), three auxiliary warships for a total of 34,407 GRT and damaged one further ship of 6,986 GRT. Gross register tonnage or gross registered tonnage, is a ship's total internal volume expressed in "register tons", each of which is equal to 100 cubic feet (2.83 m3). Gross register tonnage uses the total permanently enclosed capacity of the vessel as its basis for volume. Typically this is used for dockage fees, canal transit fees, and similar purposes where it is appropriate to charge based on the size of the entire vessel. Heinrich Wilhelm Herbert Wohlfarth was a successful World War II U-boat commander. He was also a recipient of the Knight's Cross of the Iron Cross. The Knight's Cross of the Iron Cross was awarded to recognise extreme battlefield bravery or successful military leadership. Viktor Schütze, was a German U-boat commander during World War II. He was a recipient of the Knight's Cross of the Iron Cross with Oak Leaves of Nazi Germany. Werner Hartmann was a German U-boat commander in World War II. He was credited with sinking 26 ships, amounting to over 115,000 gross register tons (GRT) sunk, purportedly making him the 25th most successful U-boat commander of the war. He was a recipient of the Knight's Cross of the Iron Cross with Oak Leaves of Nazi Germany. Carl Emmermann was a German U-boat commander during World War II. In his time as commander, he succeeded in sinking 27 ships for a total tonnage of 152,080 gross register tons (GRT). Peter-Erich Cremer was a German U-boat commander during the Second World War. He was a recipient of the Knight's Cross of the Iron Cross of Nazi Germany. Karl-Heinz Moehle was a German U-boat commander of the Second World War. From September 1939 until retiring from front line service in June 1941, he sank 21 ships for a total of 93,197 gross register tons (GRT). For this he received the Knight's Cross of the Iron Cross, among other commendations. Rolf Mützelburg was a German U-boat commander during World War II and a recipient of the Knight's Cross of the Iron Cross with Oak Leaves of Nazi Germany. Mützelburg died on active service on 11 September 1942 following an accident at sea. Klaus Scholtz was a commander in the Kriegsmarine (navy) of Nazi Germany during World War II. He commanded the Type IXB U-boat U-108. Scholtz was a recipient of the Knight's Cross of the Iron Cross with Oak Leaves. Günther Hessler was a KriegsmarineFregattenkapitän during World War II. He commanded the Type IXB U-boat U-107, sinking twenty-one ships on three patrols, totalling 118,822 GRT of Allied shipping, of which 86,699 GRT was sunk on one patrol alone. He was the twenty-first overall most successful U-boat commanders of World War II by tonnage sunk. Hessler was a recipient of the Knight's Cross of the Iron Cross and was commissioned after the war to write the official account of the U-boat war by the British Ministry of Defence. 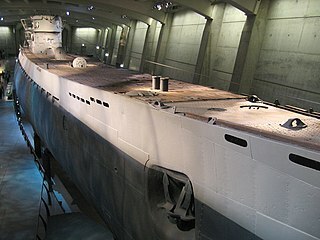 Robert-Richard Zapp was a German U-boat commander in World War II. As commander of the Type IXC U-boat U-66, he sank sixteen ships on five patrols, for a total of 106,200 tons of Allied shipping, to become the 27th highest scoring U-Boat ace of World War II. He was also a recipient of the Knight's Cross of the Iron Cross. The Knight's Cross of the Iron Cross was awarded to recognise extreme battlefield bravery or successful military leadership. Victor Otto Oehrn was a Fregattenkapitän with the Kriegsmarine during World War II. He commanded the U-boats U-14 and U-37, sinking twenty-four ships on four patrols, for a total of 104,846 tons of Allied shipping, to stand 28th on the list of highest scoring U-Boat aces of World War II. Hans Jenisch was a Kapitänleutnant in Nazi Germany's Kriegsmarine during World War II and a Kapitän zur See in West Germany's Bundesmarine. He commanded the Type VIIA U-boat U-32, sinking seventeen ships on seven patrols, for a total of 110,139 gross register tons (GRT) of Allied shipping, to become the 26th highest scoring U-Boat ace of World War II. Jürgen Oesten was a Korvettenkapitän in the Kriegsmarine during World War II. He commanded the U-boats U-61 and U-106, and then served as a staff officer before returning to command U-861. He sank nineteen ships for a total of 101,744 gross register tons (GRT), and damaged four others for 51,668 GRT to become number 29 on the list of the highest scoring U-Boat aces of World War II. Helmut Rosenbaum was a Korvettenkapitän in Nazi Germany's Kriegsmarine during World War II who commanded U-boat U-2, U-73 and the 30th U-boat Flotilla. He received the Knight's Cross of the Iron Cross, awarded to recognize extreme battlefield bravery or successful military leadership. He is credited with the sinking of six ships for a total of 35,171 gross register tons (GRT) and three warships. Jost Metzler was a Korvettenkapitän with the Kriegsmarine during World War II, commander of the U-boats U-69 and U-847, and recipient of the Knight's Cross of the Iron Cross. Adolf Cornelius Piening was a Kapitänleutnant with the Kriegsmarine during World War II. He commanded the Type IXC U-boat U-155, sinking twenty-six ships on nine patrols, for a total of 140,449 gross register tons (GRT) of Allied shipping, to become the nineteenth highest scoring U-Boat ace of World War II, and receiving the Knight's Cross of the Iron Cross. The Knight's Cross of the Iron Cross was awarded to recognise extreme battlefield bravery or successful military leadership. Hermann Rasch was a German U-boat commander of U-106 in World War II. He was a recipient of the Knight's Cross of the Iron Cross of Nazi Germany. Erich Würdemann was a German U-boat commander in World War II and recipient of the Knight's Cross of the Iron Cross. 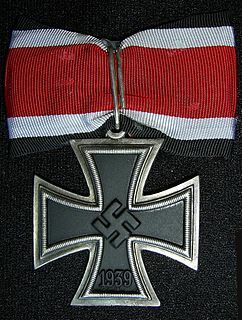 The Knight's Cross of the Iron Cross was awarded to recognise extreme battlefield bravery or successful military leadership. Horst von Schroeter was a German U-boat commander during World War II. He was a recipient of the Knight's Cross of the Iron Cross of Nazi Germany. After World War II he joined the West German Navy and from 1976 to 1979 held the position of Commander of the NATO Naval forces in the Baltic Sea Approaches (COMNAVBALTAP). 1 2 3 4 "Kapitän zur See Ernst Kals". uboat.net. Retrieved 18 April 2010. 1 2 3 Busch & Röll 2003, p. 255. ↑ Fellgiebel 2000, p. 250. Scherzer, Veit (2007). Die Ritterkreuzträger 1939–1945[The Knight's Cross Bearers 1939–1945] (in German). Jena, Germany: Scherzers Militaer-Verlag. ISBN 978-3-938845-17-2.